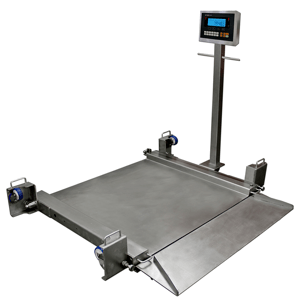 With its high quality, fully stainless construction and IP69 rated loadcells, the highly portable MODI (Mobile Drive-In) platform scale complies to GMP and HACCP production standards and is ideal for harsh, wet and sanitary environments where hygienic cleaning is vital. The OIML approved MODI platform scales have 4 folding stainless brackets that effortlessly rotate to lift it onto wheels for easy transit. The platform scale comes complete with a steering handle mounted on a convenient column and a removeable easy access ramp. A premium quality and robust build makes the platform scale ideal for Pharma, food production, cosmetics and other high hygiene factory conditions. Dimensions range from 850mm to 1500mm and capacities from 300kg to 3000kg.